The life of a ten-year-old black girl is shattered by two drunken and remorseless young men. The mostly white town reacts with shock and horror at the inhuman crime. Until her father acquires an assault rifle–and takes justice into his own outraged hands. For ten days, with burning crosses and the crack of sniper fire spreading through the streets of Clanton, Mississippi, the nation sits spellbound as young defense attorney Jack Brigance struggles to save his client’s life… and then his own. When Clay Carter of the public defender’s office reluctantly takes the case of a young man charged with a random street killing, he assumes it is just another of the many senseless murders that hit D.C. every week. But as he digs into the background of his client, Clay stumbles on a conspiracy too horrible to believe. 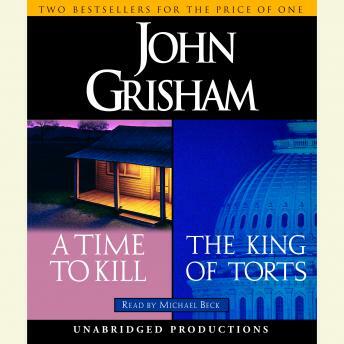 He suddenly finds himself in the middle of a complex case against one of the largest pharmaceutical companies in the world, looking at the kind of enormous settlement that would totally change his life–that would make him, almost overnight, the legal profession’s newest king of torts . . . Very good. Couldn't stop listening!! Will be listening to it again and again!! Loved them both!! Kept me on the edge of my seat the whole time. Can't wait for more books! An easy listen while getting stuff done around the house.